These Audiophile level speakers are constructed of a revolutionary new composite plastic that can withstand drops and bumps. You get 4 options to use these speakers; Bluetooth, SD/TF Card, USB Flash Drive, and 3.5 mm. Direct line in. Don't hesitate - these are the ones. Compatible with any Bluetooth device including iPhone, iPad, iPod Touch, Tablets, Android, Windows, Blackberry Phones, Moto Actv, PC, Mac, and any gaming devices. ✔ THE ULTIMATE TRUE WIRELESS STEREO EXPERIENCE - BIG SOUND SMALL SIZE! ✔ Less than half the price of the big brand name Speakers with all the same features, miniature size, and build quality! You get advanced wireless audio technology providing seamless connection to your smartphones and other Bluetooth devices. Most importantly, you get unparalleled sound quality. Includes TWO (2) Speakers that operate in FULL Stereo Bluetooth mode, or independently. ✔ AWESOME VERSATILITY WITH 4 IN 1 FUNCTIONALITY ✔ These speakers offer 4 different modes of usability. Stereo Bluetooth Mode, aTF/SD Card Slot, USB Flash Port, and direct link in with a 3.5 mm. 2 audio cables are included in the box. All this and over 6 Watts of pure unadulterated power! These Speakers even come with handy strap so you can have your music exactly where you want it! ✔ LIGHTNING FAST CHARGE TIME ULTRA LONG BATTERY LIFE ✔ Cutting edge technology allows for up to 6 hours of continuous play / talk time on a single charge thanks to an upgraded rechargeable li-ion battery. Charging is a breeze and happens in less than 2 hours. 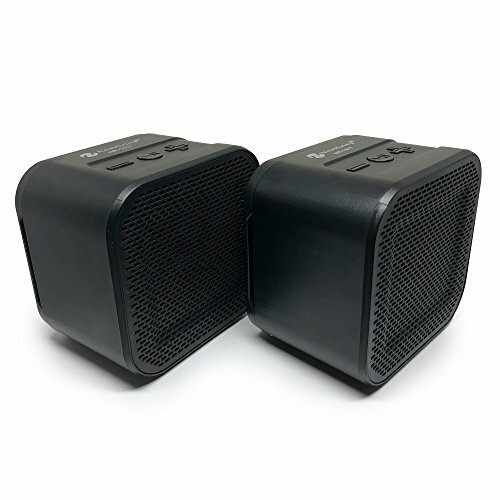 Plus these speakers can be used as a pair, or individually. They are packaged separately as well, so you can keep 1 for yourself and gift the other one - if stereo sound is not your thing! ✔ HANDSFREE CONVENIENCE FOR IMPORTANT CALLS ✔ Featuring easy to use music/call control on each speaker. Never worry again about missing those ever important calls that cannot be ignored, while you are checking out your favorite tunes. Advanced NFC technology makes the microphone in these speakers among the best available on the market today. View More In Portable Bluetooth Speakers. If you have any questions about this product by Long Run Technologies, contact us by completing and submitting the form below. If you are looking for a specif part number, please include it with your message.